Rosehips are abundant in British hedgerows in autumn and early winter, and are easily recognisable – fat, bright red buds with spiky black ends. They are a bit of a wonder food – high in vitamins C, A and B and rich in antioxidants, they are used to make syrups, jams, jellies, even bread and pies. 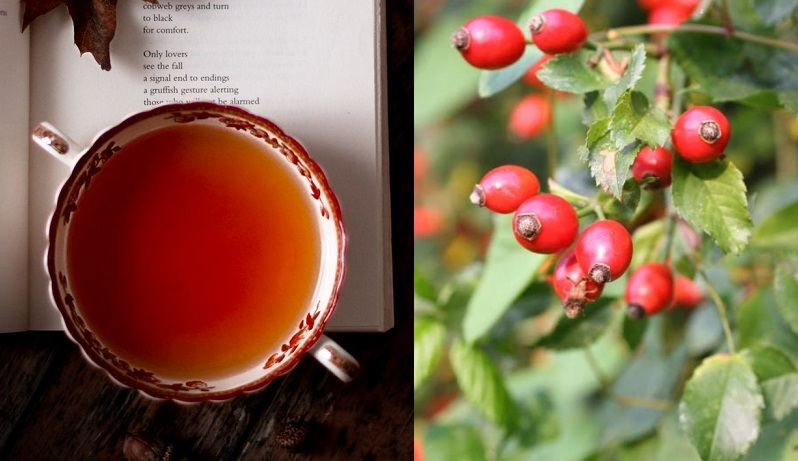 If you’re a bit of a beginner in the foraging stakes, start off with my healthy and delicious rosehip tea recipe, which is fantastic for beating winter colds. 1. You’ll need about a handful of rosehips per cup of tea, but if you find a glut of them it’s a good idea to pick a basketful to last you all winter. Pick rosehips which are firm and bright red, ignoring any that appear shrivelled. You can also buy rosehips dried from health shops. 2. If you’re using fresh rosehips, you’ll need to dry them first. Spread them on newspaper and leave in the sun. No sunshine? Pop them in the oven on a low heat. When they appear leathery, they’re done. 2. To make tea, pour ome cup of boiling water over two heaped teaspoons of chopped rose hips. 3. Steep the herbal tea, covered, for 15 minutes and strain. The liquid should be a warm orangey red. 4. Sweeten with honey if you like. You can also add lemon juice or a few mint leaves. I’ve been staring at the rosehips on my apothecary rose, wondering what to do with them. Now I know. Thanks so much!!! Splendid, they grow wild in the Indian Himalayas. Let me try some on my next trek. Thank you for sharing.